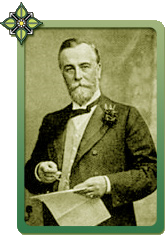 Frederick Sargood was one of the great merchants and politicians at the beginning of the 20th century. A supporter of federation he stood unsuccessfully as a delegate to the 1897 constitutional convention. However he later achieved election to the first Commonwealth Senate in 1903. The Sargood family has strong connections to the St Kilda area. Frederick’s father was the elected member for St Kilda in the Lower House and was a merchant like his son. The mansion and superb gardens of Frederick’s former home near St Kilda, “Rippon Lea”, is now a National Trust property and visited by thousands of people every year. As an officer in the Volunteer Artillery, Sargood conducted military exercises at the former rifle range in Elwood. Complaints ensued after the historic tea tree at Point Ormond was destroyed as a result. Sargood arrived from England with his parents and five sisters as a 16 years old and soon joined his father’s firm. He joined the Legislative Council in 1874 but resigned after his first wife died and returned to England with his nine children. After marrying Julia Tomlin, he returned and successfully re-entered the Council, this time to become Victoria’s first minister for defence. He loved his job. He was a fine shot and was already in the Volunteer Artillery. He flung himself into building up the Navy and forced the Colonial office to accept Victorian control of local defence forces. We have Sargood to thank (depending on your viewpoint) for the establishment of the school cadet corps. He was a free trader when most politicians of all shades and the media in Victoria were fiercely protectionist (Kerferd, Murray Smith and Cowderoy). Sargood’s other politics were mixed. He opposed ‘one man-one vote’ but supported the factory bill that aimed to protect workers from long hours. From 1888 Sargood was the unofficial leader of the Legislative Council at a time of extreme confrontation with the Lower House, but was tactful in his attempts to avoid constitutional crisis. The Upper House was under attack as a bastion of privilege as reformists sought to apply one-man, one-vote principles and implement land reform. Alfred Deakin and other democrats were mindful of their experiences in Victoria when they insisted on democratic representation in the Federal senate during the constitutional conventions of 1891 and 1898. The financial collapse in the late 1880s saw many of Sargood’s fellow politicians disgraced but his businesses were among a few that actually grew during this time. The Upper House blocked many attempted reforms of the financial system although in 1893 Sargood introduced a bill to limit the sale of speculative shares. His roles in business and public life were extensive, including membership of the board of the Commercial Bank, president of the Melbourne Chamber of Commerce, on the committee for the Melbourne Centennial International Exhibition, a commissioner of Water Supply and on the Board of Land and Works. This eminent Melbourne personality died suddenly in 1903. His funeral procession to St Kilda Cemetery included eight massed bands, 1200 cadets, a firing party of 300 and was watched by thousands of people. 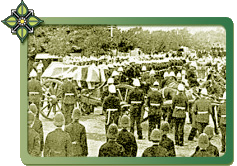 Draped over his coffin was the original Union Jack that the Duke and Duchess of York had raised on 9 May 1901 to commemorate the opening of Parliament and the achievement of Federation.